Dr. Tim Karis studied Communication Sciences (Media Studies), Modern History and Public Law in Münster and Amsterdam. At the Münster Cluster of Excellence „Religion and Politics“ he wrote his PhD-thesis on media portrayals of Islam on the German TV-news-magazine „Tagesthemen“ (Springer VS, 2013). His other publications include papers on discourse theory, particularly focusing the relationship of discourse and mass media. 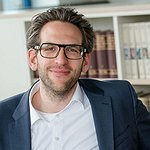 As a postdoc, he worked as a coordinator of the research group „Religious Pluralism as a Challenge for Religions and Societies“, which is situated at the Center for Islamic Theology in Münster. In his most recent research project, he focuses on the ways religious pluralism can be a challenge for particular aspects of media regulation. For example, there have been debates in Germany about whether or not to give air time on public broadcasting stations to Islamic communities – a privilege hithero reserved for Christian and Jewish groups. This project will compare the regulatory situation as well as related debates in Germany, the Netherlands and the U.K. Since April 2015, he is a Postdoch for he field of „Religion & Media“ at the Käte-Hamburger-Kolleg.